For the past month or so, I have been getting reminders of a new publication on open innovation in R&D Management. The first reminder came from fellow OI researchers who thought it a curious decision. Things at work and home were too busy to follow up right away. The second came two weeks ago in the form of a suggestion from Google Scholar. Uncharacteristically, I was searching Google Scholar when logged in to Google — something I try to avoid doing for privacy reasons. Google likes to suggest new (apparently first online publication) articles based on spying on my publication history. Often Google’s suggestions are uncanny in their fit, as in 2013 when it suggested the article by Linus Dahlander and Henning Piezunka that was a hit at the 2012 London conference, the first (and lead) article in our 2014 special issue of Research Policy — and where I was the nitpicking guest editor who made their life more difficult (and perhaps improved the paper in some small way). 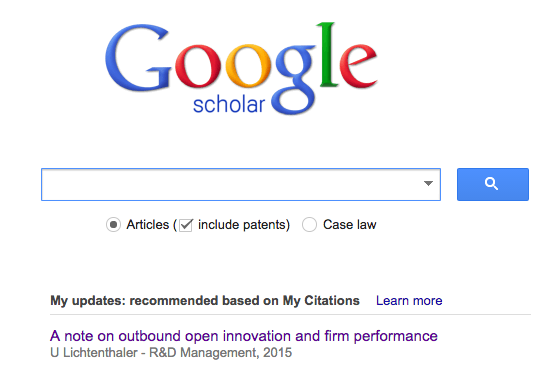 In 2013, the Google Scholar suggestion was for an exceptionally good OI article. This month, it was perhaps the last hurrah of the discredited, fired ex-academic whose who will be remembered in innovation studies as the greatest fraud of the early 21st century. Those words might have been harsh after one retraction, but after 16 retractions in the past three years I think we should apply the “fool me twice” rubric. Entitled “A note on outbound open innovation and firm performance,” the new 1,008 word article in R&D Management includes a 135-word abstract and 25 references. The recently accepted publication seems to be a final reward for Ulrich Lichtenthaler, former chaired professor and onetime wunderkind who in late March left his job at Mannheim after losing the reputation (and most prominent publications) that had earned him the job. … In this regard, inbound open innovation has attracted substantially more attention by researchers than outbound open innovation (West and Bogers, 2014). Nonetheless, the importance of outbound open innovation has been increasing along with a growing trend toward open innovation in general (Grönlund et al., 2010; Tranekjer and Knudsen, 2012). Because of the emphasis on inbound rather than outbound open innovation in prior research, the relationship between outbound open innovation and firm performance has received insufficient attention to date. Moreover, the empirical analyses of a prior paper about this topic unfortunately included accidental errors (Lichtenthaler, 2009). Beyond the specific empirical findings, however, the general conceptual idea of that article holds, and it is supported by arguments in other researchers’ recent contributions. Open innovation in general and outbound open innovation in particular may have both positive and negative effects on performance (Kline, 2003; Laursen and Salter, 2006; Enkel, 2010; Faems et al., 2010; Knudsen and Mortensen, 2011). although the empirical data is wrong, the general idea was correct because others wrote about similar ideas before and after me. Perhaps, under other circumstances, one might conclude that is a plausible explanation. But in similar cases, editors drew different conclusions. While a few editors decided it was easier to let the authors retract their paper than to actually make their own decision, several editors of top journals expressed concerns about the accuracy of the empirical analysis in many of the 13 articles. (2) In the RP papers and the other closely related papers, the author has been inconsistent in his treatment of the variables. In particular, variables treated as important in the 2009 RP paper are disregarded in another parallel paper (in R&D Management 2009), and vice versa. In the case of the 2010 RP paper, when it is examined in conjunction with three other closely related papers (in Journal of Product Innovation Management 2009, Strategic Organization 2009, and Organization Science 2010), there seems to be an omitted variable bias problem that would invalidate the conclusions of RP 2010. In both cases, this raises severe doubts as to the validity and robustness of the conclusions drawn in the two RP papers (and indeed in the other parallel papers). If the referees and editors involved in handling the two RP papers had been aware of this (i.e. if their attention had been drawn to the other closely related papers and they had spotted this inconsistency), they would undoubtedly have rejected each of the RP papers on methodological grounds. After the RP Editors had made their decision to retract the two papers (but before he had been notified of the outcome), the author wrote to acknowledge a third problem with RP 2009, namely that the statistical significance of several of the findings had been misreported. In the light of this new problem, the author asked to withdraw RP 2009. However, by then the editorial decision to retract that paper on the original two grounds listed above had already been taken. This article has been retracted by the journal's Editors, Oxford University Press, and the author. The article has been retracted because of statistical irregularities and because of incomplete citation to other work by the author. This article has been retracted at the request of the Editor-in-Chief of Academy of Management Journal. Formal investigations by the Academy of Management Journal and an affiliated university of Professor Ulrich Lichtenthaler have revealed ethical violations in research practices. Those violations center on the larger data collection effort that forms the foundation for this article as well as the empirics and reporting in the article itself. Independent re-analysis has been unable to replicate the findings as reported in this article and other journals have retracted other published pieces from the larger data collection effort. We are contacting you in your role as editors of R&D Management (henceforth RDM) because we believe a recent paper published in your journal by Ulrich Lichtenthaler entitled “Outbound open innovation and its effect on firm performance: examining environmental influences” (RDM, volume 39, issue 4, pp. 317-330) raises serious concerns. We have attached the relevant paper to this email. 1. The author’s paper in RDM contains key elements that were published elsewhere prior to, or simultaneous with, their appearing in the RDM article. In RDM, however, the author does not refer to any such studies in the relevant sections and instead presents his findings as novel and unique. 2. Across his papers, the author uses a large number of independent variables to predict the same (or related) dependent variable as the one used in the RDM paper. Nevertheless, many of these independent variables are not included as controls in the RDM paper. 3. The paper contains statistical results that are fraudulent. The level of significance of 14 correlations is potentially flagged inconsistently and, more strikingly, all regression coefficients used for hypothesis testing are insignificant, even though the author flags three coefficients as significant at the 5% level. As we hope the evidence shows, all three our concerns – redundant publication, deliberate omission of known controls, and statistical fraud – represent breaches of acceptable scholarly standards. But we also believe they represent serious breaches RDM’s author guidelines, which state that “The contribution of the author(s) should be a completely original one, it should in no way violate any existing copyright, and it should contain nothing of a libellous or scandalous character.” All authors subscribe to this rule when submitting a paper for consideration at RDM. This case clearly suggests a significant pattern of misconduct, a deliberate and systematic attempt to mislead the editors and reviewers of RDM and other journals about the novelty of the research, and the statistical validity and significance of the empirical findings. Prior to 2015, Lichtenthaler had published five articles in R&D Management, but its editors have thus far retracted none of them. I have no insight as to why R&D Management has issued no retractions, particularly for (what the investigator called) the most problematic of the remaining Lichtenthaler papers. Instead, this process of serial fraud was inexplicably rewarded with a sixth article. Is this because of a lack of scientific capabilities to investigate such fraud? Some certainty that this 2009 paper is different from the previous 16 frauds? The other journals instead felt that their own reputation going forward was more important than protecting the editorial decision on this one paper. Ulrich Lichtenthaler is an expert in the fields of open innovation and technology management. Even if not applied in an academic setting, such expertise could be commercially valuable in consulting or training. The 36-year-old Lichtenthaler still needs to find a way to make a living for almost three decades, as even his most persistent critics would admit. Mercy is an integral part of the Western system of justice: the punishment for large-scale fraud should be the loss of the academic career, not debtors’ prison. However, this article — like all the others — shows no evidence of contrition over the well-documented serial fraud. Instead, one finds denial and attempts at mis-direction. At least in the American justice process, forgiveness (such as pardon or parole) requires an act of contrition — but it appears none is forthcoming. Open innovation have been changing both the practice and theories of innovation since the publication of the first Open Innovation book in 2003. Open Innovation provides insights for how firms can harness the inflows and outflows of knowledge to improve the firm’s innovation success. At the same time, Open Innovation has also become a popular (and well cited) area of innovation research. To help identify and develop the best new theoretical and applied research in Open Innovation, we are organizing the second annual World Open Innovation Conference (WOIC). While the first WOIC was held in Napa Valley in 2014, the second WOIC will be held in Santa Clara, in the center of Silicon Valley. Our Silicon Valley location will allow attendees to see how the principles of Open Innovation are being applied by the leading high-technology companies of the world. As in 2014, the conference will allow leading and emerging Open Innovation scholars to present their work, interact with other scholars studying related topics, and hear the latest trends in Open Innovation research. In additional to research papers, the conference seeks to engage Open Innovation managers to understand and discuss future research on the key challenges they face today, and a separate Call for Problems will be used to identify relevant problems and attract managerial participants. Selected papers from the conference will be published in a special issue of California Management Review: as such, both traditional research papers and those with a more managerial orientation are sought. The conference will also feature two new awards, namely a Best Student Paper Award and a Best Emerging Scholar Paper Award. Call for Problems: managers and other practitioners of Open Innovation are encouraged to submit a non-confidential description of their problems. For the exact format, see the conference Call for Problems. Research Papers: extended abstracts (1,500-3,000 words) for empirical or conceptual papers — with theoretical and/or managerial implications — will be considered for the research paper portion of the program. Authors of papers accepted for presentation will be required to submit a complete paper prior to the conference; no paper will be required for poster presentation. The submission website will be available early June. The program committee and reviewers will evaluate proposals, but will not provide feedback on the proposals. The conference organizers will be editing a special issue of California Management Review. At the time of submission, authors will have the chance to indicate whether or not they wish to be considered for the special issue. Authors of selected abstracts will be invited to participate in the special issue, which will be subject to further reviews after the conference. The conference will also be presenting an award for the best student (single-authored or being lead author) paper and best emerging scholar (PhD awarded 2010-2015) paper. At the time of submission, authors will asked to indicate whether or not they are eligible for either of these awards.